Posted on 23rd November 2018 at 3:39 pm. 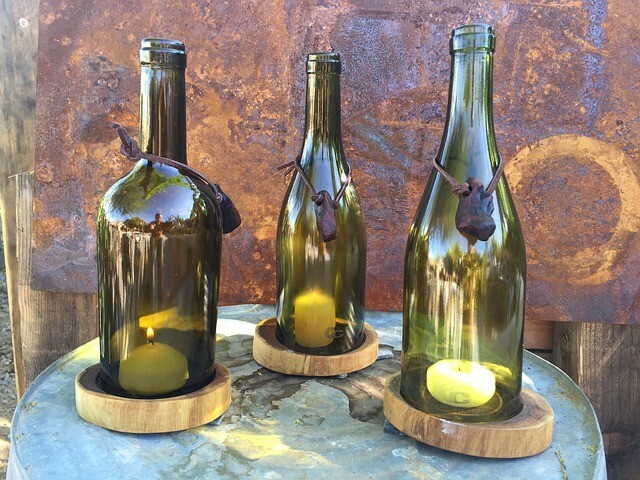 In recent years, upcycling has become a very popular trend, and for good reason, too. Of course, upcycling is certainly not a new trend. During the 1930s and 1940s the UK population had to be extremely thrifty, as it was a time when most families had very little in the way of economic or material resources. During WWII, the instruction was to ‘make do and mend’ – in other words, to manage with what you’ve got, and fix it if it breaks, rather than replace it. In today’s world, the upcycling trend is prevalent due to the positive impact it has on our environment. But it’s also a great way to create or to acquire something for nothing or, at most, for very little – perfect for those looking to do things on a budget. When searching for items that can be ‘upcycled’, a good place to start is in your own home, especially in lofts, garden sheds and garages. The majority of us are highly likely to have a whole range of different items that we no longer use, items that could potentially be given a new lease of life. Trawling websites such as Gumtree and Freecycle, or the classified listings in your local newspapers, are also great ways of sourcing things for your home and garden that can be upcycled into usable items. You may be surprised to find the kinds of things that people are offering for very little money, or even giving away for free. With upcycling being such a popular trend, we thought it would be a good idea to look at some upcycling ideas that can be used to enhance your garden. We’ve used some of our own ideas, mixed with some inspiration found online, to come up with a list of 5 ways in which you can utilise upcycling to improve your garden. 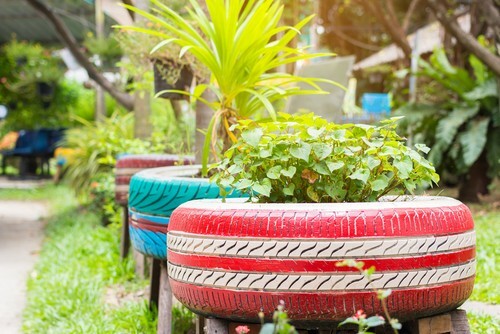 Old tyres are a staple upcycling item, largely because they can have such a wide variety of uses. We love the idea of using them as quirky planters, as in the picture, below. The tyres can be placed around your garden, or even hung from trees or set against a garden wall. Take things a step further and try painting them bold colours to create a real impact in your garden. You’ve probably got a collection of part-full paint cans tucked away somewhere, too, so it’s a good way to use up the leftovers! Old tyres are easy to get hold of – try asking your local tyre shop for any unwanted tyres they may have. There’s nothing better than relaxing in your garden during warm summer evenings with a glass of wine. 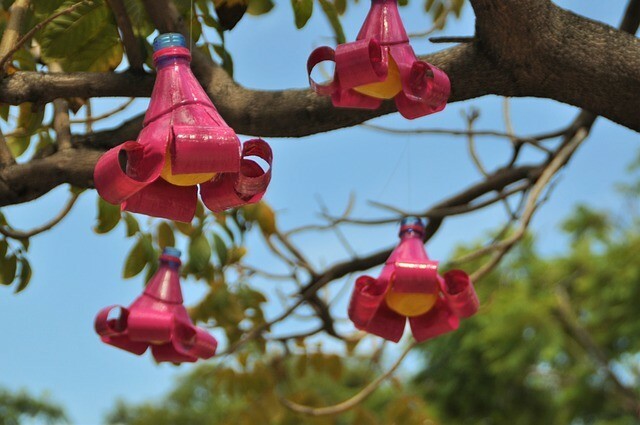 And when it gets dark, there’s no need to go indoors – at least not if you have one of these upcycled garden lanterns. Creating mood lighting can easily be achieved using lanterns such as this one, which was created using an upcycled glass bottle which has been decorated and the bottom cut off to allow for a candle to be placed inside. The damage plastic is doing to our environment has been well documented in recent times, and this clever use of plastic bottles is a great way to recycle your unwanted plastic. These plastic bottle flowers have been created by carefully cutting the bottle to form petals, which are then painted bright colours and assembled to represent flowers. 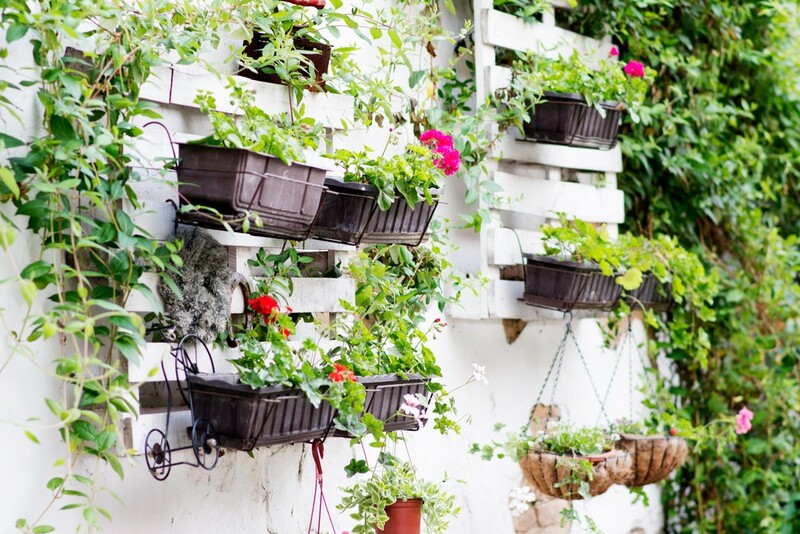 String can then be tied to the flowers so they can be hung from a pergola, archway or even a hanging basket bracket. Of course, it goes without saying that you should be very careful when cutting plastic bottles, to avoid injuring yourself. Look around on online classifieds and you’ll always be sure to find someone offering scaffold boards at a few pounds each, or sometimes even free of charge. Scaffold boards can be used for a variety of different uses within the garden. 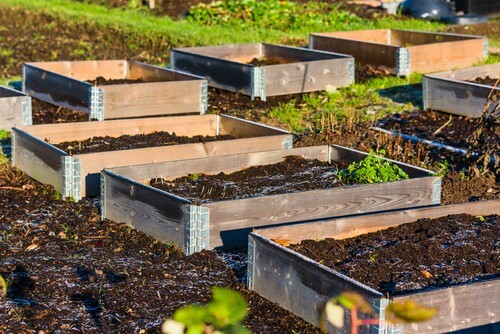 You could use them to form a raised planter or to create a vegetable patch, similar to the one below. Another idea would be to use them to make your own compost bin. This has the further benefit that you can recycle your garden and food waste to create nutrient-rich compost for your soil. This is a double whammy, as it’s great for the environment and great for the plants in your garden, too. We couldn’t write an article about upcycling without including pallets. Timber pallets are one of the most widely used items in the upcycling world. That’s because they have so many uses. They are also easy to get hold of – we recommend checking the classified ads, both online and in local newspapers, to find people giving them away for free. It’s easy to build planters out of pallets. They can be freestanding, or else fixed to a garden wall or sturdy fence to create a form of living wall. You can also customise them, by painting them any colour you can imagine. We hope you have found the ideas in this article to be inspirational and, perhaps, even to have motivated you into doing some upcycling of your own. 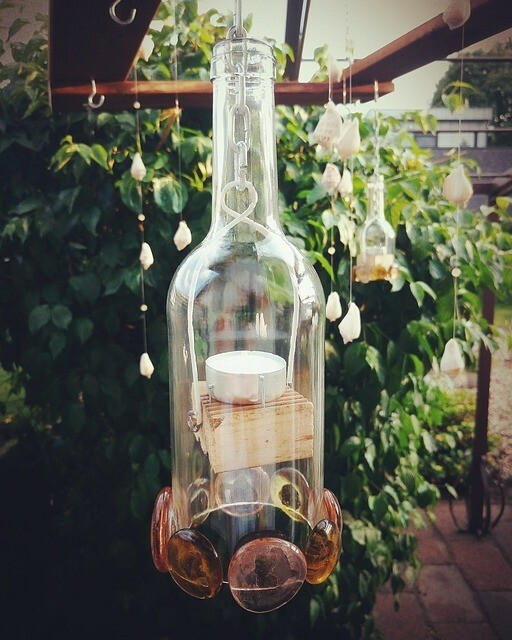 If you do, you may be surprised at the impact upcycling can have on your garden, and how easy and fun the process can be. And, what’s more, you can feel satisfied that you’ve also done your bit for the environment – and saved yourself some money in the process. Do you have any other ideas as to how we can utilise upcycling to improve our gardens? If so, be sure to leave us a comment below and help our readers to transform their gardens.